1861. Cara has a simple mission in a steam and mechanically powered London – finalise her father’s estate and sell off his damned collection of priceless artifacts. Her plan goes awry when a killer stalks the nobility, searching for an ancient Egyptian relic rumoured to hold the key to immortality. 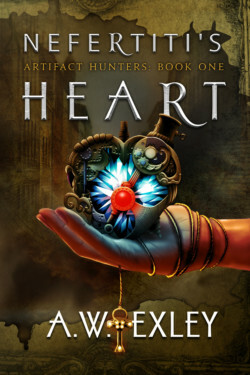 Self-preservation fuels Cara’s search for the gem known as Nefertiti’s Heart. In a society where everyone wears a mask to hide their true intent, she needs to figure out who to trust, before she sacrifices her own heart and life.